It’s no secret, the complicated history of Black Americans and the satisfaction of life outside of the United States. For over a century Blacks have found their way to more accommodating cities across Europe. To escape the racism of the 1960s, Blacks made the move abroad to countries like France, creating more fulfilling lives as artists and entertainers. Think of the likes of Josephine Baker, James Baldwin, Richard Wright, Nina Simone, and others who experienced ideological and political awakenings that led to more freedoms found in residing outside of America. Today we still find Black artists and intellectuals making the choice to thrive in Europe, Asia, and Africa as opposed to being stuck in a semblance of the life they dream of in their native America. One such artist, Akua Naru, has emerged as a creative visionary in Cologne, Germany, trailblazing as a poet and MC for over a decade. For those unfamiliar with her style as a lyricist, she’s extremely well-read, cultured and enlightened, much like Blitz The Ambassador, spinning metaphors and weaving in similes from every imaginable, recognizable reference. 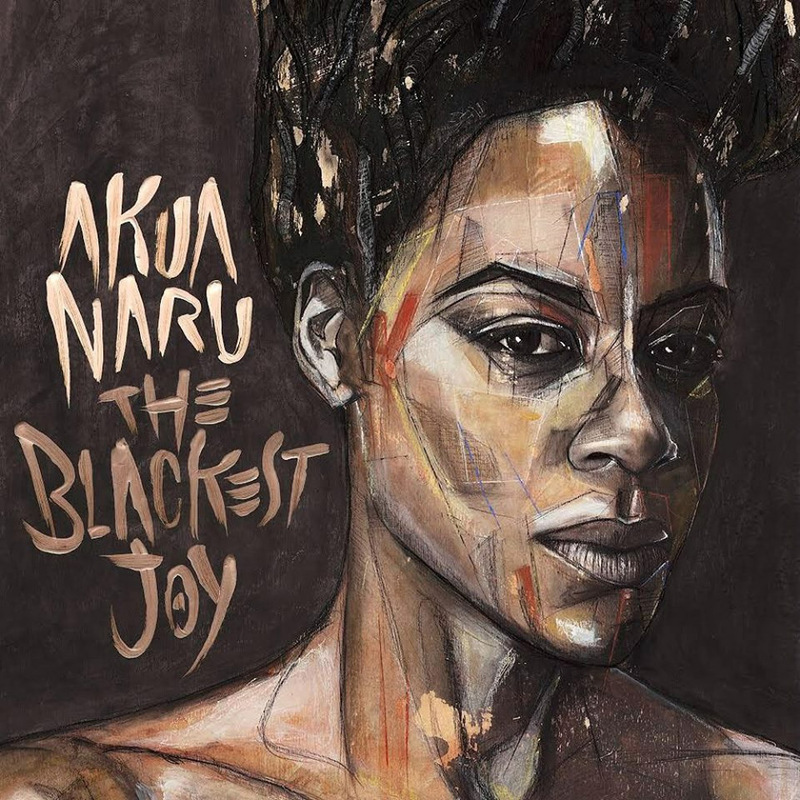 “The Blackest Joy”, her latest hip-hop soul jazz mashup LP, is indeed that, a joy that picks up where 2015’s “The Miner’s Canary” left off. On it, you hear influences of The Roots, the Fugees, the Wu-Tang Clan, Black Star, A Tribe Called Quest, and of course unsung female MCs like Bahamadia and Rapsody. But the album also conceptually speaks to the masters of the jazz form, from John Coltrane to Roy Hargrove. It’s truly a thick, delicious gumbo of horns, strings, and African rhythms seasoned with the roux of lyrical pan-Africanism. It’s not surprising that Akua Naru grew up on the East Coast of the U.S. writing the type of poetry that would become the types of rhymes that would take her on a journey around the world. And it’s also not surprising that tracing her roots across West Africa and Asia would foster the creative influences of this current album, “The Blackest Joy”. But not since Solange’s “A Seat At The Table” have we heard such a collection of songs in one complete project with the sole purpose of highly esteeming Blackness, and more specifically, Black women. The album’s theme unfolds as if Akua decided to singlehandedly address Malcolm X’s theory that the most disrespected, unprotected, and neglected person in America is the Black woman. “The Blackest Joy” begins and ends with the infinite and serene ocean breeze, and the ubiquitous trumpet threads a Sankofa vibration throughout the album. There’s great ambiance mixed with the range of languages heard throughout the African diaspora. It’s very Les Nubians meets Floetry, but authentic enough to stand on its own without comparison. Songs like “Made It”, “Kaya”, “Joy”, and “Black Future” have emerged as fan favorites, while other compositions pay homage to Black American heroes. There’s an uptempo, Digable Planets-like ode to the G.O.A.T. icon Serena Williams, and a gorgeous ballad in honor of writer James Baldwin. “(Love) Right Now” begins with a soulful organ and unfolds into a ballad that lyrically nods to both Nina Simone and Jill Scott. “My Mother’s Daughter” feels like Philly’s Black Lily of the early 90s and builds upon layers of revolutionary concepts weaving a beautiful tapestry that is Akua Naru’s story. “Black Genius”, written in particular for Black women, adds to the overall feminist vibe of the album and speaks of the struggles and joys that exist in this world. Backed by her six-piece band, “The Blackest Joy” is the hope of the future anchored by the beautiful struggle of the past.